Hotel access control seems to work magically. 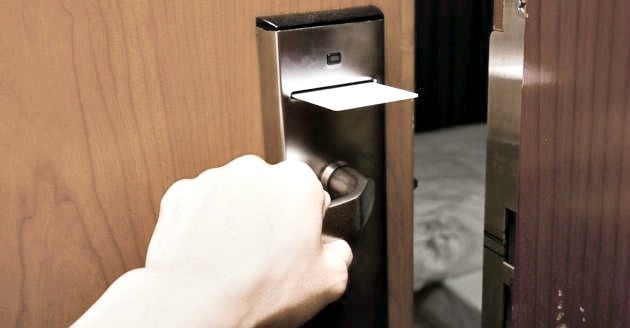 Unlike electronic access control systems used in commercial security, doors in hotels are not typically connected to a central server to confirm access. ** *** *********** ********, 'key ****' ******* *** typically ******** ***** ***** mag ****** **********. * 'system' ** ******** ** individual, ***-********* **** ******/*****, a **** **********, *** encoded ****** *****. *** central ********** ***********, ******* at *** ***** ****, encodes * ******* **** common ****** ****. ********: * ****** **** to ******** *** ******* as * '***** ****', 'Master ***', '************ ****', or ***** **** ** role. '***** *****' ********* open *** ****, ***** a '****** ***' **** may **** **** ***. ***** ****/****: *** **** ****** a **** ** **** to **** * ****. This *** **** ******* a '***** ****' ** calibrate ******* **** ****** time. **** ******: * ****** ** value ******** ** *** lock/room *** **** *****. This ********* ****** ******* to *** **** *** guest ****. ******** ******: * ****** **** that ********** *** ********** property/floor/wing * **** ** encoded ***. **** ******** using *** **** *** 'Room ***' ** ******** facilities. *** **** **** ****** on *** **** ****** to ********* **** ** should ******, ** *** system ****** ** *********** not ********* *** **** lock ** '*******' *** makes ** ****** ******** only **** * **** is *********. ******** **** ** ***** for ***** ******* ** make ******** *****. ****** brass **** ****, ******** must ** ********** ** cheap ****** ** ******* after * ****** ***. * *** ***** ** these ***********: *** **** stripes ** ***** ***** are * '******' ********** ************* ************** ** **** ********* types ** *********** **** contactless **********. ***** **** *** ****** in *** ******** '***************' of ***** ***** ** subjected ** **** **** magnetic *******, **** ********* is ***** ********* ** a ******** *********** ** the **** ** '***** service ****' ** *** issued **********. *** ******** card ******** ****** ******** the ***** ******* ** expiring ***** * ***** time, ***** * *** days. ***** *** ***** ** door ******** *** **** greatly ********* ** ****** and ******, '*****' ***** can ** ********* *** less **** $*** ***. Some ******* ****** **** in '****** *****' ****** sell *** **** **** $75 ***. ** ********, enterprise-grade ********** ********** ****** control ******* ***** **** upwards ** $**** *** door. ** *******, **** ***** are ******** ** *** only *** **** ******* door ***** ***** *********** or ******* *******. ****** other ***** ** ********** access *******, *********** ******* only **** **** * specific **** ** **** and ****** ** ******* to ******** *****. *** ******* ****** ********** in ********* ******* '***********' and ********** *** ******* is *** **** ** the **********. ** * *********** ******, the **** **** ****** an ******* ******* ** open *** ****. * hospitality **** **** *** no ********* ************* ** how ***** * ********** may **, ** **** opens **** *** **** being ********* '***** **' to ****. *** ********** encoding ******** *** ********* and **** ****** ** activate *** ****. ** ********, ** ********** EAC ****** **** **** the ********** ** ******** a ******* *** ******. The ********** ****** **** not ***** * ******* to **** *** ****, it ****** ********** *** holder ******* ** '********' dataset *** *****. *** networked ******** ** *** reader ****** **** * central ********, *** **** actuates ******** ** ****** entry ***** ** **** database. ******* *** **** reader ** *********, * credential **** *** ** 'turned ***' ** ******** immediately. * ****** ******** **** arises **** *********** ******* is "*** **** *** door **** **** ** deny ** ****?" ***** a ****** ***** **/***** out ********, **** ****** is ********** ** *** 'valid **** *****' ** access ******* ** *** card. **** *** ***** out **** ** *******, the ******* **** ** the **** ** **** as '*******' ****** * certain *****. *******, *** dynamic **********, **** ********** early *****-**** ** ******** stays, ******** ***** **** a ***** ****. ** accommodate *** ***** **********, it ** * ****** requirement **** ***** *** the ************ ***** *** 'refreshed' ***** ***, *** the '********' ***** ** a ***** **** **** are ******* ***** **** the ************ ***** ****** their ***** ***** ****** their ******. ************, ******** ***** *** not *********** ** *** same ****** ***** ** guest *****, *** *** be ********** *** ********** access. *******, * ****** feature ** ***** ***** is *** '********** ********' deadbolt **** ******** *** external **** ****** **** thrown. *** ***** *************, it ** ****** ** see * **********, ***** door **** ** *** lever **** ****** ****** in ** *********. *** ******* ************** ** hotel ******* ******* *** they *** *********** ** purchase, ********, *** *******. Despite *** ****** '**** tech' ********** ***** ******* give ******, *********** * new **** *** ******* it ** * ***** is **** ****** *** inexperienced ****** ** ******, and ******* ** ***** disposable ****** *** ****** be ****** **** ****** than ******* '*** **********' like *********** *******. ******* *** **** ***, typically ******* *** ****** threshold ** ********** **** pursue. ** *** **** **** of *** ****, *** manufacturer ** **** ** control *******. ***** ******* depend ** *** '***' of *********** ******* ******, and ** * ****** they **** *** **** hardware *** ************ ***** near ****. *********** ****** ********* ***** 'keycard *******' ** '****** items', *** ***** ****** buy *********** ******** (*****, battery *****) **** ********** pricing ******** **** *********** supply ************, ****** **** security ***********. *** **** ********* ** this ******** *** ** avoided, *** *** ********** mitigated **** ***** ****** systems. **** * ***** networked ********** ****** ******, such ** ***** ***** immediately ** ********* ** made, *** *** **** lock ****** ********** ** simply *** **** ** remain ****** ** ******* users ***** *** ******* is *********. ***** ******** ** ****, hospitality ****** ******* ** not * ****** ******* typically ******** ** *** security **********. ***** ********** certainly *****, *** ******* for **** *** *** limited ****** *********** *** high ******* ********* ***** systems *********. ** *******, the ******** ******** ** traditional '*********' ****** ******* is **** ** '********' and ******* ******** ** the *** ****, ******* built ************ ***** ** the *********** ******. Great article. When I was younger I was fascinated with these systems (especially the cards with all the little Braille-like holes), but no one I knew could explain. In a hospitality system, the card read issues an encoded command to open the lock. A hospitality door lock has no networked understanding of how valid a credential may be, it only opens when the card being presented 'tells it' to open. The credential encoding contains all decisions and data needed to activate the lock. Doesn't the lock still authorize in a sense by checking a black list of cards to deny? Can a door reader ever rewrite cards? In general, no. Unless the card itself tells the lock 'I'm valid right now", it just is ignored. Validity is based on date or function, but not a list of cards. There generally is no 'black list' or 'white list', just an open population of valid cards. For most systems, no. There may be some systems that can invalidate cards if they are inserted in locks (This is the way Salto Access 'networked cards' work for example), but the vast majority of hotel system locks are 'read-only' units. Validity is based on date or function, but not a list of cards. There generally is no 'black list' or 'white list', just an open population of valid cards. So in your example of early checkout, what denies the old card, (or its duplicates), from opening the door of the new guests? The encoding machine at the front desk is the kingpin here. As soon as the new card is presented to the door lock, the old card is no longer valid. A lock is typically only able to have one valid guest. So it is not a 'blacklist', but rather 'active valid cards must have these values'. A hospitality door lock has no networked understanding of how valid a credential may be, it only opens when the card being presented 'tells it' to open. The credential encoding contains all decisions and data needed to activate the lock. IMHO, the credential encoding of a given key has all but one piece of data needed to activate the lock, namely value from the previous open. The lock needs to maintain the current state of what the last valid key sequence used was, so that it can reject credentials issued earlier and accept those equal or later. If the lock were to lose the power (and that value), for instance, an old or new credential might be accepted. Thanks for the answers; this is a minor point in any case. I think 'blacklist' is too strong of a term here. The lock does have a memory of which cards were used to open it, but 'blacklist' meaning active denial is not quite right. Cards are read to be invalid based on expired dates/times or because they've had their function preempted by another valid read. Those cards housekeeping carry may also be used for quality control too. As in: once guest card 'A' expires, guest card 'B' cannot be used until a 'Housekeeping' function card opens the door, signifying a visit and room cleaning. Rather - new guests can't enter a dirty room. Now, these rules aren't always put in place, but some hospitality operators use the access system for process/quality control in this way. Brian, good article. A few years ago a hack of Onity locks was reported at Black Hat using a portable programmer to gain entry. I wonder if there are still vulnerable locks out there, particularly at independently operated hotels. Also, every one of the hotels I've stayed in this year have updated to a proximity card solution. Some hotels even use an app on your phone that communicates with the lock when in range. It might be a nice follow up to explore how the same comparisons with these new technologies in the hospitality space. I was always curious how those systems worked. Hey Brian….nice update on the hospitality market. You are correct it is far too expensive (even for new build let alone retro fit installs) to wire every room door and that is the main reason why each door is basically its’ own controller in the hospitality market. Another reason why manufactures are so vertically integrated (install directly or through subs) is that hotel access falls in the grey area between traditional security and locksmith markets. Most security guys I know are not fond of installing door hardware and locksets with associated life safety issues and liability. And locksmiths (overall) are not big on programming, initializing, commissioning, maintaining the electronic/software application side of these systems. Although the gap is closing for sure – imagine what it was like when these card systems first came on the market 30 some years ago. Finally, hotels demand to know where the buck stops when something is not working not only after a new installation but for the life of the system (>10 yrs)…and to get training and parts (hundreds of part numbers in each system) immediately. Remember this is a perishable product. If they can’t rent a room that night...they lose revenue that cannot be replaced. Many are big brands and/or ownership groups that require the kind of national and sometimes international support that cannot be consistently supported by local or regional contractors. So that is why this market is kind of carved out from the rest. Lastly, RFID cards are becoming more common slowly but surely just as happened in 90s for access control. The main issue here is price/card…. but the hotels are getting over it and touting the higher security, easier/cooler customer experience, and benefiting from reduced maintenance of cleaning/replacing door readers and reprogramming demagnetized cards. Interestingly some manufactures are choosing open card protocols (buy wherever you want) and others are closed (only from mfg). Sound familiar? But that is another discussion!!! Thanks Brian.